FilterSolo: note the two sizeable knobs. 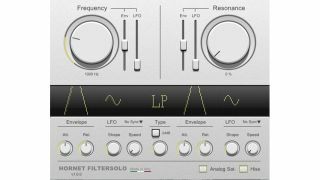 HoRNet has served up a new resonant filter plugin in the shape of FilterSolo. Said to emulate the sound of an analogue filter, it's billed as "a perfect creative tool for sound shaping and design". FilterSolo offers low-pass, high-pass, band-pass and band-stop filter types with 12db or 24db slope. There are sizeable cutoff and resonance controls, each of which can be modulated with its own envelope follower. There are also two LFOs. The analogue saturation and hiss features can be turned off if you don't like them, and all controls are displayed on a single screen. FilterSolo can be purchased now from the HoRNet website priced at €17.90. It's available in VST, AU and RTAS formats for Mac and PC, and there's a demo to try, too.